If you don't make a plan, then by default you plan to fail. That's not going to be you girlfriend, because we're going to help YOU plan! As we approach the holiday season, many of us will find ourselves traveling out of town or hurrying from place to place. These are the times people are most likely to turn to fast food. Survival mode kicks in, and we find ourselves having to compromise more than we normally would. We want to equip you to enter this season strong! Good, Better, Best is a motto at Lisa Lou Fitness, and although home-made is best, sometimes we gotta eat on the run. 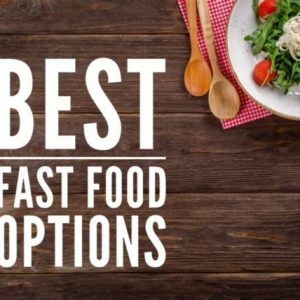 Opt for these fast-food options when you need to grab and go! McDonalds, Wendy's, Burger King, Chic-Fil-A, Arby's, Subway, etc: Most fast food restaurants offer salad as an options. Leave the croutons off and ask for olive oil dressing, or, where available, opt for avocado in lieu of any dressing! Jimmy John's: You can make any JJ sandwich into an Unwich! This is the same great sandwich wrapped in lettuce as opposed to bread. Panera: This place has a myriad of options! With a variety of delicious salads and the ability to build-your-own, you can't go wrong! Again, leave the croutons, and use an olive oil or avocado! Panda Express: Forego the rice and lo mein and ask for broccoli beef. They also offer grilled veggies as a side! Au Bon Pain: Vegetable Beef Barley is a satisfying and healthy choice. IHOP, Denny's Waffle House: Ask for an omelet stuffed with veggies. Of course, salad is an option here too. Outback, Texas Roadhouse, etc: Skip the Bloomin Onion and rolls and go straight for the steak. Sweet potatoes or other veggies are always on the menu as a substitute to fries or baked potatoes. Don't forget the salad! Buffalo Wild Wings, Cheddars, etc: Salads are an option here as well. In the mood for a burger? Go bunless! Wherever the holidays take you, we're confident you are well-equipped to make choices that'll leave your body, mind, and spirit feeling satisfied! Here's to good health on the go! Great suggestions Lisa! Thank you! Thank you for the encouraging information on the ability to eat healthy while on the road! As someone that travels a lot it is helpful to know of options available at different types of restaurants. You’re so welcome, Ramonda! Traveling is a challenge, but not a death sentence 🙂 Happy choices! Thank you so much for this. I love your new eamils and so appreciate you sharing your expertise with us. I need all the healthy food suggestions I can get. So glad you find the emails helpful, Denise! Thrilled to be able to bring valuable information to you and others!